Human rights campaigners will rally outside 10 Downing Street on Monday to protest against the demolition of refugee camps in northern France and to demand Prime Minister David Cameron take in more migrants fleeing conflict. Protestors, who will assemble outside Downing Street at 6pm, are demanding French authorities abandon plans to raze the southern section of the “Jungle” refugee camp in Calais. Campaign groups have filed a legal case against the local government in an attempt to block the forced evictions, which charity Help Refugees estimates will displace 3,500 people, including hundreds of unaccompanied children. A hearing is set for Tuesday in Lille at 2pm. A Facebook page for the protest, organized by campaign group Stand Up To Racism (SUTR), indicates hundreds of people will attend the demonstration. “Stand Up To Racism has called for a protest at Downing St 6pm next Monday 22nd February. 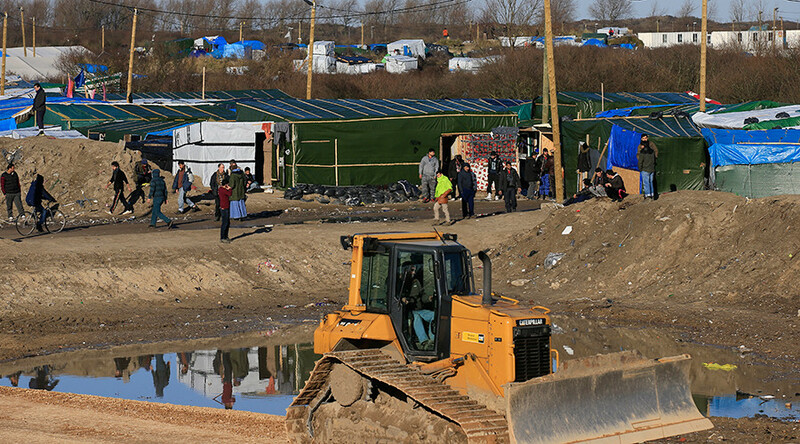 Don’t bulldoze Calais refugees homes, let them into Britain,” the Facebook page reads. Joint National Secretary of SUTR Weyman Bennett said the British government has spent more money keeping refugees out than on helping them. “What’s driving this is racism and Islamophobia and it is coming from the highest levels. The British government and David Cameron have spent more money on razor wire rather than helping these refugee,” he said in a statement. SUTR’s other Joint National Secretary Sabby Dhalu said Britain’s contribution to relieving the refugee crisis is tiny compared to countries neighboring Syria. “The real solution is to allow refugees in the camps to seek asylum in Britain and to lead a normal human life. Hollywood actor Jude Law and playwright Tom Stoppard visited the “Jungle” camp on Sunday to raise awareness about the upcoming evictions. Law is one of 150 public figures to sign an open letter calling on the British government to allow children with family in the UK to be reunited. Other famous signatories include actors Benedict Cumberbatch and Idress Elba. “It’s our responsibility as humans to look after our children. The children at the camp in Calais need us. It isn’t a big ask. It is simply the right thing to do,” Law said during his visit to the camp. The Conservative government has largely ignored calls to admit more refugees beyond the planned 20,000 from Syria over the next four years. Labour has called on the PM to admit refugees with family connections in the UK. In a letter to the Guardian, Green Party member Rupert Read argued the British left should campaign for the UK to admit refugees instead of European “economic migrants” who hold the right to work in Britain as EU citizens. “This country has so far accepted a shamefully low number of refugees from war-torn and drought-stricken parts of the Middle East and North Africa,” he wrote.